Like the sprinters at a Track & Field meet, the alarm buzzing on your phone is your cue to quickly take a leak, brush your teeth, shower, and shave. But since you hit the snooze button 10 times too many, you now only have about 5 minutes to do all of the above. One of the biggest ways that you can save a few minutes on your morning routine is to try and combine steps. Of course, as you could guess by the title of the article, using the fogless mirror while in the shower will allow you to shave without the need for additional time to clean, rinse, etc. A cheap and inferior mirror will have you trying to brush the fog aside every two seconds to see what you are actually doing. 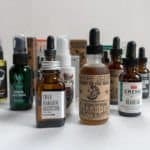 Now depending on the type of razor that you plan on using in the shower, a foggy and obscured look at your face will leave you reaching for the styptic pencil to repair your nicks if you aren’t careful. 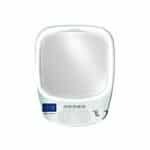 That’s why we strongly recommend men to pick up one of the best fogless shaving mirrors on the market that we outlined below in order to deliver a clear view of your face when shaving in the shower. When initially doing the research on the topic of fogless mirrors, we thought basically that a mirror was a mirror. Sure, it probably had a special coating on it, but at the end of the day all the products would pretty much be the same. Well, to be quite honest, we couldn’t have been more wrong. One of the most popular types of fogless mirrors will be those featuring a chemical based coating to keep the fog at bay. This technology while great when just starting out, will likely dwindle with time. You see, the fogless mirrors with a chemical coating require complete removal from the shower stall when not in use. The reason for removal is to further reduce deterioration of the coating. To try and reverse this trend of poor performing mirrors, there are products like Zadro S or Quick Spit Antifog that will allow you to recoat your mirror when needed. 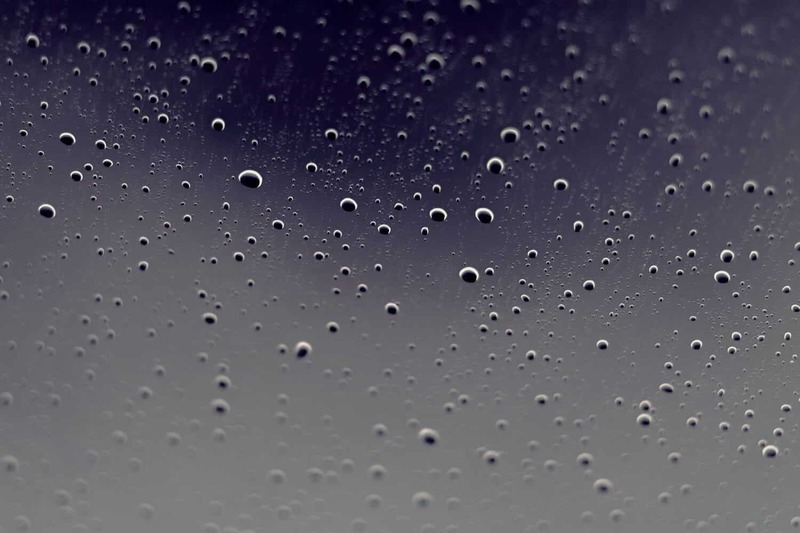 Another handy trick that we experienced was that if you simply use warm soapy water on the surface of the mirror, it should help to keep the fog off the mirror for an extended period of time. Mirrors like the ToiletTree or the Brookstone Fogless Mirror will have a reservoir placed directly behind the mirror that will help to ward off fog. Much like when you drive a car when it’s raining, the reservoir will heat the glass of the mirror to be at the same temperature of the water and steam that will consequently remove the fog. 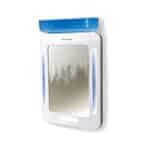 Fogless mirrors with reservoirs should be able to theoretically last a lifetime without ever relying on an anti-fog spray. Like the InterDesign Fog Free Mirror, this option will affix directly to the pipe that is coming out of your wall. 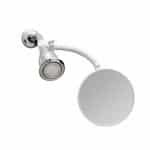 This mirror type acts as an intermediary between the pipe and the shower head. At the top of an attached mirror design, you will have a valve where you can siphon off the water that is currently coming out of the shower and warm the mirror (just like the reservoir type above). The biggest drawback for this mirror is the more complicated installation method. 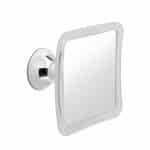 A pivot head mirror will be perfect if you share the shower stall with others in your house (or apartment/dorm). With its unique ability to point upwards, downwards, and side-to-side, it can easily work for all those at different heights and preferences. In addition, with a pivot based mirror you can point it away from the shower if you prefer not to get splashed while making the passes with the razor blade. 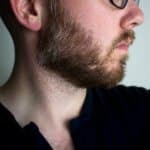 If your shower stall is incredibly dark whether its due to poor lighting or perhaps a dark shower curtain, then an LED lit mirror will help you to see your whiskers more easily (this is especially true if you have a thin light colored beard). 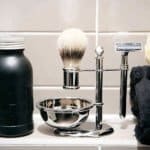 Now many men may have their own shaving hook if they currently use a double edge safety razor, however for those that rely on a disposable or cartridge based razor will love the addition of a razor hook. Hooks are a great way to dry off your razor post-shower and ensure that no mildew builds up around the crevices. With these backings, they unfortunately don’t affix to a wall for an extended period of time. Therefore, no matter the hour (be it 6am, 3pm or 11pm), they will eventually fall off the wall in your shower stall at some point in their life. More permanent than suction cups, adhesive strips will likely come in the form of double sided tape and attach to most surfaces. 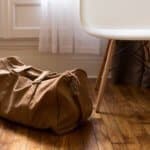 With this uncompromising versatility, this method is preferred by men who live in a home (as opposed to more temporary situations like a dorm or apartment). 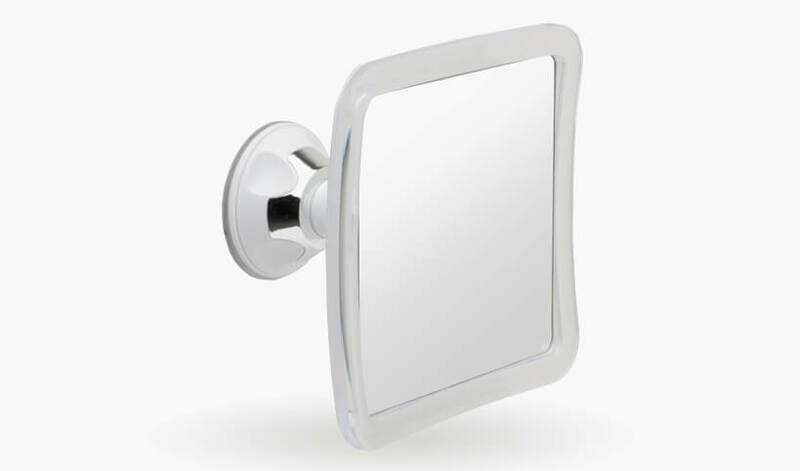 Whether its screwed to the shower pipe coming from the wall, or simply hooked around the pipe itself, shower hook mirrors are the most portable, and likely to withstand the hot wet environment of shower stalls the longest. Note: move table left and right for additional columns. This dead simple, extremely budget friendly mirror is great for the cost-conscious shopper. Featuring just an adhesive hook and mirror, its minimalist design will serve you well for your shower shave. While most fogless mirrors will feature a suction cup design at this price point, this is a pretty good value. To extend the lifetime of the mirror we would recommend removing it from the mirror after every use to preserve the coating. Also, given its compact 6.8” x 5.25” x .13” design, you should be able to fit this into your favorite dopp kit while traveling. Beyond just the shower, this mirror can be useful for checking your edges when you shave, or any other scenario where a mirror is required. This incredibly complete mirror by ToiletTree features a slew of features that will work great for shaving in the shower. 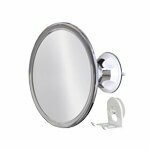 With its mounting method relying on a silicone adhesive, you shouldn’t have to worry about this mirror falling off the wall like its suction cup counterparts. As we mentioned earlier, this mirror features a reservoir behind the plate of glass. Therefore, the heated mirror will prevent fog from forming on the surface while you are showering. Without a chemical coating on the mirror, there will never be a degradation of performance with the ToiletTree. 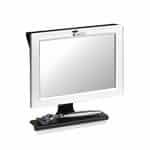 The additional features on this mirror however, is what really makes it stand out. As seen above, the mirror features a streamlined shelf where you can easily rest your cartridge razor between showers. 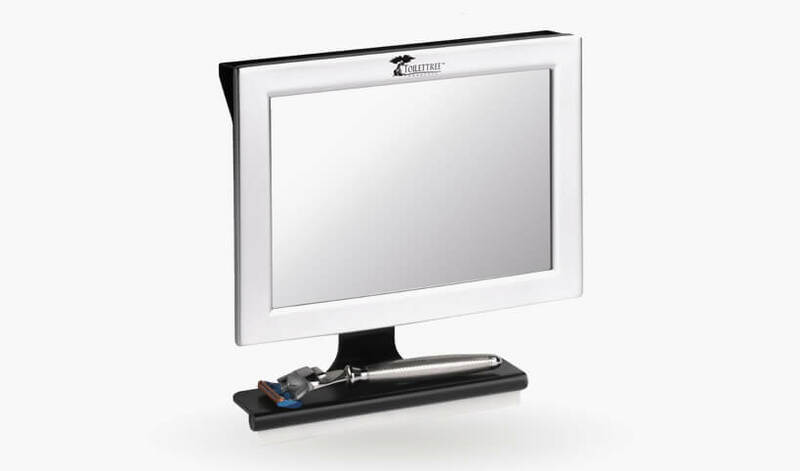 Secondly, this mirror also has a built-in squeegee that can be used on the surface to ensure that it dries drip free for maximum clarity and performance. If you feel like splurging, they also make a model that includes LED lights too! While there is no better feeling than having a beer while in the shower, the next best thing is going to be this fogless mirror by ART+SOUND. With this fogless mirror, you can get the morning traffic report with its built in FM radio. What’s more is if you don’t feel like listening to commercials, this mirror also has Bluetooth connectivity. Through Bluetooth, you can stream your favorite Spotify or Apple Music playlist to the mirror for the ultimate shower singing experience. When it comes to the mirror itself, it’s a coated fogless mirror that also relies on suction cups for adhesives. 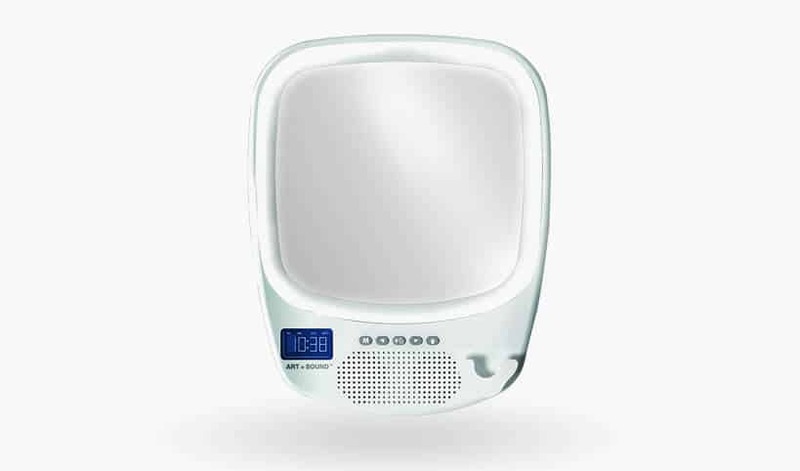 Since this does contain a hefty bit of technology in the mirror, the manufacturer does make mention that the speakers can only withstand misty and random splashes of water. Therefore, it’s probably best that if you go with this mirror, to hang it on the opposite end of the shower stall away from the water to increase the life of your morning tunes! 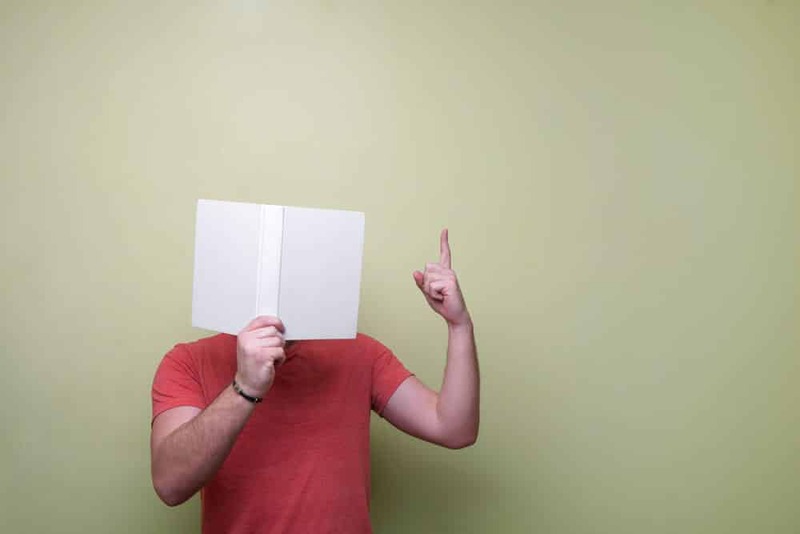 One of the biggest caveats to the many fogless mirrors listed so far is that they are affixed to the wall with an adhesive or suction cups. Their primary utility is to stick to the wall once, and remain there for the lifetime of the mirror. However, if you share the bathroom with a spouse, other family members, or even roommates, the above mirrors don’t count for everybody’s different heights. 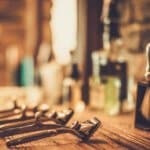 When hung, the others that share the mirror must crouch or stand tip-toed to see their face while shaving. The No Fog Shower Mirror by Upper West Collection aims to mitigate this inconvenience with their 360 degree rotating shower mirror. With the ability to pivot upwards and downwards or even side to side, you will be able to adjust the mirror for maximum comfort. 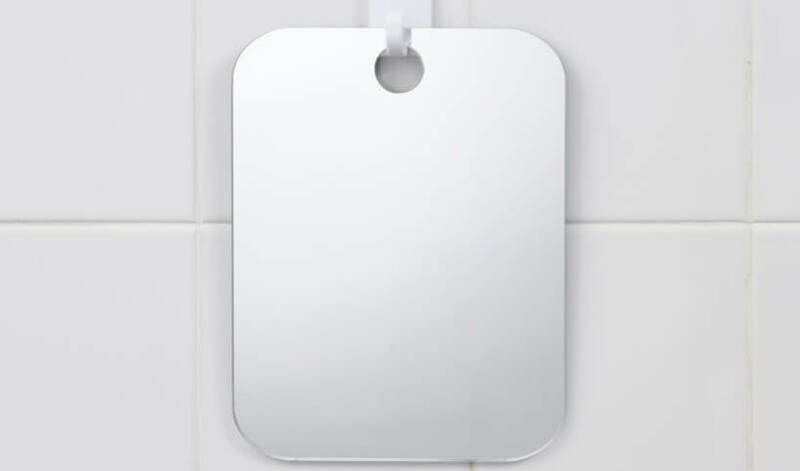 Beyond the rotating neck, this mirror is guaranteed to be fog free for life by simply applying hot soapy water to the surface while in the shower. To further provide peace of mind, this mirror does come backed a 100% satisfaction guarantee. 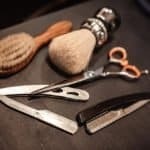 As an additional throw in, if you are using a disposable, cartridge, or even a double edge safety razor, you will be happy to know that it also includes a separate razor holder that you can place in the shower next to the mirror, or elsewhere that may be more convenient. Very similar in nature to the Upper West Collection circle mirror featured above, this mirror by Mirrorvana also features a pivot neck. With an installation step that only takes a few seconds (through the use of suction cups), this mirror is geared primarily towards the men who are on a budget. 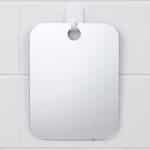 With it’s sub $20 price tag, it will get the job done as serving as a fogless mirror in your shower. Noticeably absent from this mirror is a storage hook for your razor. If you favor this mirror shape, it may be something to keep in mind when proceeding to the checkout. To achieve a fogless advantage, the Mirrovana relies on a chemical coating that will deteriorate with extended use. Therefore, to lengthen the life span of this product, its recommended not to put it in direct spray of the water. Furthermore, if you want to chemically treat this mirror yourself, a product like Quick Spit Antifog is a great complimentary purchase. 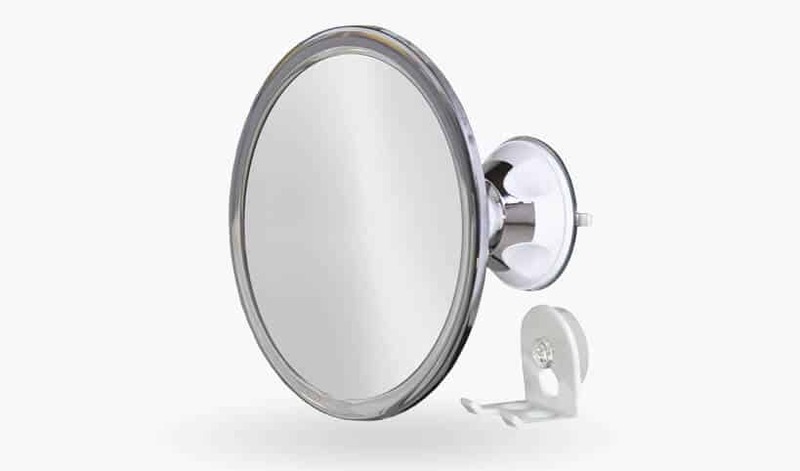 While not as compact and portable as the Deluxe Shave Well Fog-free Shower Mirror nor does it have all the bells and whistles like the ART+SOUND, this fogless shower mirror by InterDesign is a barebones shower mirror that gets the job done. Unlike most mirrors that either have a coating or a water reservoir pocket to keep the mirror from building up fog, this mirror by InterDesign is truly unique. While still housing a reservoir like the ToiletTree mirror, this mirror connects directly to the water source. With its control valve placed at the top of the line, you can easily siphon water to go to the mirror to ensure a fog free experience no matter what temperature you keep your water. This mirror is a great no-nonsense shower mirror that not only will be great while shaving your face, but if you sport a bald look, this mirror will also help tremendously. The biggest caveat for this mirror will be the installation process. 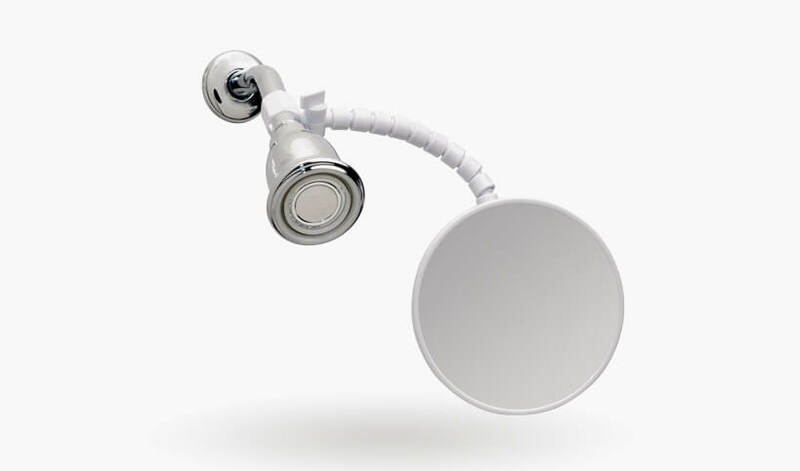 While the others rely on an adhesive or suction cup, you will need to break out the wrench and remove your shower head to add this mirror fitting on. 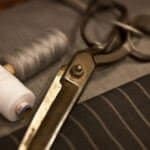 A sloppy job may lead to leaks and subsequently a lower water pressure, therefore be sure that you use some Teflon tape when putting everything back together. 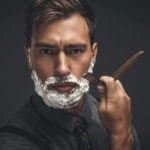 For many men, the lighting conditions in their showers may not be the best when it comes to shaving. 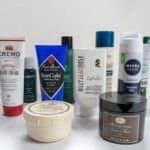 Especially if you have light and thin whiskers, being able to visually see where you may have missed a spot while shaving may be nearly impossible with many of the other fogless mirrors listed so far. We were excited to see that Brookstone made such a product that will be able to serve such men while in the shower. Beyond adequately lighting your face for easier shaving, the mirror does have an auto-off feature that will turn off the lights after 10 minutes of activity. If you find, that you are always running out the door, you don’t have to worry about the batteries being completely depleted on your next shower. LED lights aside, the fogless feature of the mirror is also top notch. 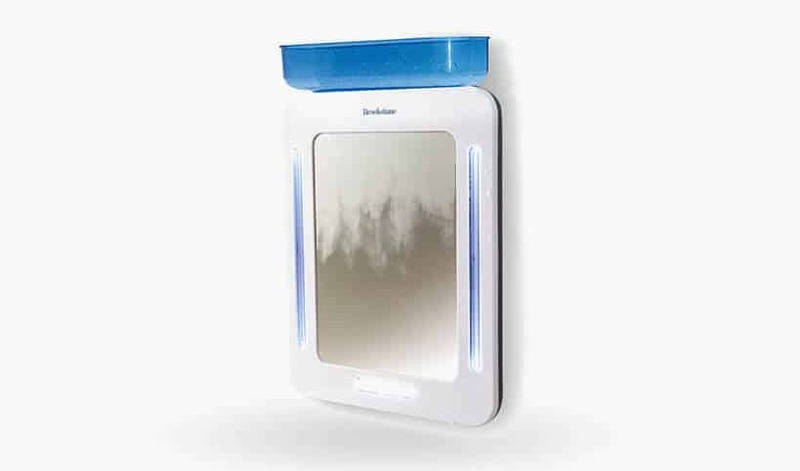 Featuring a reservoir slot for behind the mirror, the Brookstone Fogless Shower Mirror doesn’t rely on a chemical coating that deteriorates with age.